Welcome to the age of the millennials, and may the odds be ever in your favor. Who are these millennials and where can you find them? Look no further than a college campus. Defined as, the generation growing up after the Cold War in the new globalization of communication technology and wireless activity. Millennials are often characterized as being confident and always looking to achieve, but feel pressured and the need to be special. What makes millennials special is this fact: Anyone born after 1980 marks the trend of children becoming a priority again in family life. Which means, parents raised their children on the beliefs that they are special and can follow their dreams. How does this translate into finding the ability to accomplish these dreams? Going to college and taking classes is the minimum required to find a job in this competitive market. Millennials are the first to realize this fate. At Western New England University, and colleges across the country, internships have become the tackling grounds of the millennials. What better way to realize your dream then by testing it out. Having an internship isn't what is going to set you apart. It's what you do with it. The underlying principle in college is to make the most of it. Make the most of this time of your life and make the most of your experiences, including your internship. As a student at Western New England, I am currently interning at a local news station in Springfield, Mass., WGGB ABC40/Fox 6. When I first began, it was daunting. I was in the real world at the very place I dreamed of having a job. What do I do with myself? This is a question most students ask themselves while interning. Through my experience I found ten easy tips to help guide your internship and make the most of it by creating a successful experience. Look the part. Wow them with how professional you are on the outside to help reflect your inner professionalism. Not just on the first day. First impressions are everything. So uphold the first impression you make, because it will be a strong one. "At PBS, we're not required to wear anything. People do show up wearing sweats and stuff. But I always try to wear at least a button down shirt or even a tie sometimes, depending on the guest that's coming in," says Western New England student, Kevin Babcock, while dressed in a shirt and tie with a suit jacket slung over his chair. Along with looking the part, play the part. Make sure you are always on time by being 10 minutes early. If you're on time, you're late. "Professionalism is huge. How you communicate, the words you use, how you dress," says Western New England career center counselor, Andrea St. James. While interning at the news station, I always made a point of dressing like the reporter I wanted to be. And people noticed. Not just the people I worked with at the station, but people I saw while out in the field. When I introduced myself as an intern, their eyes and smiles grew wider. I wasn't just impressing the people at the station, I was impressing the public. Have a positive attitude. Light up the room as you walk in. You want them to want you there, as much as you want to be there. There are also going to be times where there isn't much to do. Don't let that get you down. Use that time to follow up on what other people around you are doing. "As an intern, at an internship in general, it's a mutual relationship and you want to give them everything you can and help build their website. But you also want to use their internship in a way. Because it's a platform for you," reflects student Bobby Caruso, who created the first interview articles for the website he interned for, Celebrity Watchdog. Act like you want to be there and ask questions. This is your opportunity to understand what the different jobs at your internship are like. Don't go in acting like you already know everything there is to know, because you don't. Be inquisitive and open to learn. "Ask for things to do. If they say we don't have anything now, find something to do. Is there a trade journal to read?" exclaims St. James as she sits at the desk in her small office. Your tasks for the day aren't always going to be handed to you. Ask for something to do. If someone is too busy to help you, find someone else who will. At my internship they would let me write up stories for the news shows. There were soundbites that accompanied one of the stories I was writing. The producer that normally allowed me to view them on his computer seemed busy. So I got up and found a photographer to help me go through the soundbites in an editing room. The next week when I came in, the producer commended me for being resourceful. He remembered that I went out of my way to accomplish a task. Be a nice and genuine person. People are going to be more likely to help you if you are nice to them. Some people are going to be tougher than others. Be sure to turn on the charm. It'll make it harder for them to say no. Networking is important. Creating a professional relationship with the people at your internship is valuable. They will be able to help you long after your internship is over. Maintain those relationships you make and periodically check in with them. A lot of places will use your internship as feeders for full time positions. The network you develop in your internships, will be recommendations for you. And it may not be immediately, it may be five years down the road. 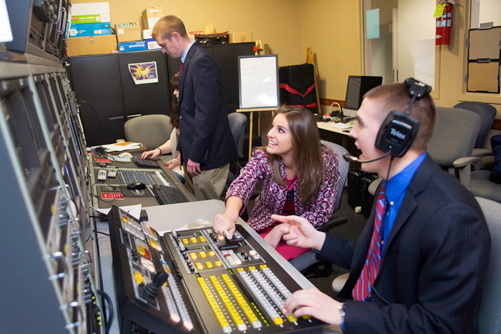 As you make connections at your intern site, keep those connections," says St. James as she describes efforts that sophomore Caruso has made. "It's just important to give it your all because that really helps you in your future. I have awesome letters of recommendation from both my editor and editorial director," reflects Caruso. Not only being persistent in your contact with the people at your internship, but also with your attitude. As the weeks progress keep your energy high. Start strong and finish strong. Keep yourself from trailing off. If there is a job you want to learn or something you want to do before you leave, keep asking about it until it happens. Their fear of saying no is probably greater than your fear of rejection. Do your research before you arrive. Preparedness goes a long way and people will notice. It's important to be well informed. Especially if this is something you can see yourself doing in the future. Also, take what you learn at your internship and continue you at school. Whether it's on your own time or in class. "I was always taking work home. When James Gandolfini died, I found out when I was getting to my car from the train back on Long Island. I pulled over at a red light and wrote the article on my phone. Got home, pulled pictures from Getty, and posted the article, before my editor even knew that he died," says Caruso. Along with finding work for yourself to do and asking if they need anything, do whatever is asked of you. Even if you don't want to do it and are not excited about it. You are there to help them in any way you can. Show them what you bring to the table and how they benefit from having you there. "Figure out what you want to do, and figure out what you don't want to do," says St. James. Internships give you the opportunity to test out the real world career that accompanies your major. They can be your greatest learning experiences. "I learned from it that's not what I want to do for my job ever," says student Lydia Lefevre, marketing assistant intern at the Springfield Armor, the Nets D league affiliate for the NBA. "Don't be afraid to make suggestions. Take the initiative. But also know your role. Be perceptive. See peoples' nonverbal communication style," advises St. James. Bring in the confidence that millennials are known for. Take initiative to not only do what is asked of you, but to do it with flying colors. You have already wowed them with your appearance and knowledge, now show them how you can apply this to skill. "Make the most of it. That's really what it comes down to," says St. James with a smile.